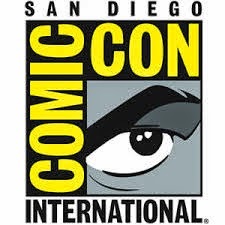 GEEK Magazine is proud to partner with Universal Studios Home Entertainment to bring fans an exclusive one-of-a-kind giveaway at this year’s San Diego Comic-Con. Featuring original artwork by Andree Wallin, the concept illustrator for the film, specially commissioned just for this convention, the bag depicts a post-apocalyptic 2017 San Diego Convention Center in ruins. Everyone who comes to Comic-Con will covet this beautiful, highly collectible tote bag. But few will be able to get this special limited edition collector’s item. The only way to get yours is to watch Geek’s Twitter feed each day to get a special “Oblivion” password or attend one of our GEEK panels where the day’s password will be revealed. Bring that password to the GEEK booth at #4014 and pick-up your own bag, while supplies last each day. And, of course, once you have a bag you’ll need swag to put in it: so be sure to pick up an exclusive “Red Star: Rapidfire” poster signed by legendary comic book creator Christian Gossett, signing all weekend at the GEEK booth, as well as our latest issue, free to anyone who purchases a print or digital subscription, as well as the 2013 Comic-Con GEEK T-shirt, available to anyone who attends our GEEK-sponsored panels at Comic-Con, subject to availability. Oblivion, starring Tom Cruise, debuts on Blu-Ray, DVD and digital download on August 6th. Order your copy below!